A player is only as good as his coach. 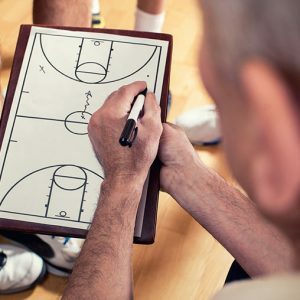 Legendary basketball coach John Wooden tells Dennis Rainey about the thrills and challenges of his highlight-filled coaching career in an interview from 2002. Bob: A basketball tournament is a test. It's a test of a team's skill and a coach's savvy. Long before the players ever show up on the court, it can be a test of an individual’s character as well. That was the case for Coach John Wooden in 1948. John: I had one black player on my team. They wouldn't let them play in the tournament, and I wouldn't go without him because he was a part of the team. Finally, they reluctantly said that he could come; but he couldn't stay in the nearby hotel where the teams were staying. He would have to stay someplace else. He could have his meals there, providing we would take them in a private room. I refused the invitation and wouldn't go. Bob: This is FamilyLife Today for Wednesday, March 30th. Our host is the President of FamilyLife®, Dennis Rainey, and I'm Bob Lepine. John Wooden would go on to be one of the greatest basketball coaches—perhaps one of the greatest coaches—in all of sport’s history. But he was known as much for his character as he was for his coaching. Today, we’ll reflect on the life and legacy of the Coach—John Wooden. And welcome to FamilyLife Today. Thanks for joining us on the Wednesday edition. Over the years, as we’ve had different guests on FamilyLife Today, many of them have been kind enough to sign a copy of the book that they have written as we’ve done interviews with them. I think maybe your favorite autographed book that you’ve ever received from a guest is the one you received from our guest today. This was 13 years ago when we sat down with Coach John Wooden and interviewed him. Then you asked him to sign the book that he wrote. Dennis: It’s one of my favorite stories about a guest—in asking for a signature on a book, Bob. I told Coach Wooden—and if you don’t know who Coach Wooden was, it’s too bad, here at the NCAA time for the Final Four / the national championship in basketball. He was arguably the finest basketball coach that has ever lived—ten national championships / coached at UCLA from 1948 until 1975—that’s a long time—and didn’t win a national championship for the first dozen or so years. Dennis: I mean, it took several years before he got his first one. But you’re right, Bob—one of my favorite stories is about asking Coach Wooden to give me his signature on a book that he’d written about success. I said: “Coach Wooden, we’ve spent some time here interviewing you. We’ve had a good time—I’ve loved interacting with you. Coach Wooden looked up at me—you’d have to have known this guy. He was 92 years and had a twinkle in his eyes. He says, “Give me a pen.” So he took the pen—had a grin that kind of wrinkled its way across his face and a little bit of a smirk. He wrote something and then closed the book—gave me my pen back and handed me the book. Bob, it’s my favorite—it is absolutely my favorite. At 92, he was this quick—this is what he wrote: “Dennis, since I never recruited from out of state, why didn’t you call me? Coach Wooden.” [Laughter] I mean—what a hoot! You’re in for a real treat—to listen to today’s broadcast, which really involves some heroism around some of the racial unrest of basketball in the early days. Bob: Coach Wooden was, not only a great basketball coach, and a man of character and principle, but he was also a champion of civil rights for his players. He shared that story with us. Dennis: A story that you tell that I want you to share with our listeners came at the conclusion of your first year at Indiana State University, where you won the conference title. You received an invitation to play in the NAIA Tournament, but you turned them down. John: First of all, my first two years were teaching at Dayton, Kentucky; and then I went to South Bend. I taught in South Bend High School, but I went back to South Bend after the war. I was discharged in January of 1946 and finished that school year. At the end of that school year, I went to Indiana State University, where my high school coach had been the coach; and he left. The president called me and offered me the position and I took it. We had a pretty good year, the first year. The NAIA Tournament is played in Kansas City. There were 32 teams then. I had one black player on my team, and they wouldn't let them play in the tournament. So even though this was—of the 12 men on the team, he played the least of all / he didn't get to play very much—and I wouldn't go without him because he was a part of the team. So I refused the invitation and wouldn't go. Now, the next year, I had everybody back on this team—exactly the same team—no one came in and beat anybody else out. The next year, we had a good year and were invited again; and I refused again. Finally, they reluctantly said that he could come, but he couldn't stay in the nearby hotel where the teams were staying. He'd have to stay someplace else. He could have his meals there, providing we would take them in a private room. I said, “No; I wouldn't do that”; but I was persuaded by the NCAA and his parents that we should go—it might help. So we went. He stayed with a minister and his wife and came into the hotel from the game. He didn't get to play very much at all, but that was the first black player that had ever played in that tournament. I think, a few years later, an all-black team won. We sort of opened the door. Dennis: As your career was taking off, you were also in the process of beginning your family. John: I wish Nellie were here to answer that question for you. Well, Nan, of course, was born in Dayton, Kentucky, when I was down there; and then Jim was born in South Bend two years later. I tried—definitely tried—Nellie always went to games with me. I wouldn't leave her to go scout, or anything of that sort, unless she couldn't go—not bring basketball home / I tried not to do that. Now, can you do that 100 percent?—probably not / but I tried not to. Nellie, when she was interviewed at times—I'd heard her say that: "John never brought the games home. I could never tell, after a game / after a practice"—of course, she was practically at all the games—"but never after a practice / I could not tell by his demeanor whether he had a good practice, or a bad practice, or any problems at all." Maybe she stretched the truth a little bit there, but I certainly tried not to. I wanted—next to faith, I wanted family first. Bob: You obviously figured out how to win without it being the consuming job that some coaches make it out to be today. Bob: That does help; doesn’t it? John: You bet it does! I’m often asked: “What schools gave you the greatest problems when you were teaching?” I’d say, “The ones with the best players,”—that was always the case. [Laughter] I was fortunate in having good players / excellent players. When you do well, that attracts. I know—after we won our first championships, it was so much easier—recruiting became unbelievably easier than it had been before. Dennis: How did Nellie keep your family on the track and help John Wooden, as a man, keep his priorities? I mean, you undoubtedly had your moments when you would work too hard, too long, and be a little too consumed with it all. How did she come alongside you?—how was she a good helpmate and counterpart to the Coach? Dennis: You had a little tradition that you and Nellie enjoyed right before the game started. John: Back when I was playing in high school, she played in the band. I'd try to position myself where I could look up and see her in the band. She always gave me a [blow a kiss], and I'd give her a wink or a nod. That continued, you know, in my teaching days. Before every game, I'd find her; and I'd give her a wink or a nod. That's probably what you're thinking of—superstition? No, it wasn't superstition—it just made me feel good. Dennis: Just a little wink. John: That's right; that's right. Bob: You wound up as the coach of UCLA because of a snowstorm. Bob: Tell us how you got that job. John: I was considering both UCLA and the University of Minnesota. They had both offered me jobs, and I wanted to stay in the Midwest in the Big 10. UCLA was going to call an hour after Minnesota was going to call. Minnesota didn't call, and UCLA called; and I accepted. About an hour later, I got a call from Minnesota, saying everything was all worked out. I said: "I'm sorry, I've committed myself. I can't back out now." There was what they called an "unseasonable" snowstorm that had the lines down, and they couldn't get to a phone to call me at the time—they said. So that's how close it came. Dennis: I want to know, Coach, why you chose coaching. I mean, you said you loved to teach English—you were a teacher at heart. John: I went to Purdue to become a civil engineer—that's what I wanted to do—but I didn't know that, to get your degree in civil engineering, you had to go to civil camp every summer. Well, I knew I couldn't go to civil camp every summer. I had to work in the summers—so I couldn't do that. Dennis: And you view coaching as teaching? Dennis: Coach, as you taught, you believed in teaching about the fundamentals. Dennis: In fact, in coming into this studio, I should have brought a pair of socks—[Laughter] athletic socks—into the studio because you took high school stars—you began with a very simple point of instruction. John: That's correct. I taught them how to put on their socks and their shoes. I wanted no wrinkles in the socks, and I'd show them how to put it on and smooth out around the little toe. Your blisters usually come from around the little toe or the heel area. I wanted to show them how to do that because I know, if you don't, they just pull them up and they don’t get all the wrinkles out. I showed them how to put on their socks and shoes. When I started doing that, back when I was teaching in high school, I found out it did cut down on blisters a lot. Now basketball is played on a hard floor. The game is stops/starts, change of direction, change of pace, and things like that. If there is any friction in there, you will get blisters. I also found out that most of my players wore shoes that were perhaps a size / at least, half a size larger than I wanted them to wear because I wanted their toes right at the end—not bent up but right at the end. I usually fit them in shoes to make sure they fit. I think they had the tendency to wear shoes that were maybe a size larger than they should. I think that came from parental teaching, again, because, when you have little children—you know, you buy their shoes and you get them a thumbnail too long. By the time their foot grows into that, the shoe is worn out so you have to get a new pair, a thumbnail too long. Children never get to wear shoes that really fit them! [Laughter] I did that. I think—it was just an important thing—a little detail—but little details is what make big things happen. Bob: You had some players who obviously became players of note, not only in college, but on into the NBA. Some of them seem to be outside of the Wooden paradigm—if I can call it that. You know, Bill Walton does not strike me as the prototypical John Wooden basketball player. It almost seems like: “Here's a guy who can play the game; but here is a disciplined coach and a player who—well, discipline was not high on his list of virtues”; was it? John: In certain areas, you might say that; but Bill is very dear to me. For many, many years, he calls me three or four times a week from all over. At the time he played for me, it was a time of the anti-establishment. He was anti-establishment very much at that particular time. I was concerned about money and things, but I have no right to determine the politics of my players, nor, actually, their religion—that's them. But he's a good student, he's an honor student, he's in the Academic Hall of Fame. When he came on the basketball floor, you couldn't ask—no one could ask for a player to be more cooperative / set a great example. Bob: You said, "If you want to keep the beard, you're off the team"? Dennis: This is an All-American you're talking to. Dennis: But you drew a line in the sand over the facial hair. John: I did; I did. Dennis: And what did Bill do? Bob: He shaved his beard off; didn't he? John: And he's been asked, "Do you think Coach would have gone through with it?" And he said, "Well, you know what I did; don’t you?" [Laughter] If I have a rule, I'm going to stand by it. But always remember there can be a gray area at times. There was a time in my teaching that I had no gray area—it was either black or white with me. I made two mistakes—I made many—but I know two that I recall that I regret very much because I didn't see the gray area. Bob: What are those two? Dennis: And you think it's a mistake, now, looking back? John: Well, he quit school. He would have gone on to college. I think I was wrong. I should have handled it in a different way. Bob: What was the second thing, you said, that you regretted? John: I had a player that didn't qualify for his letter—this was in high school. He was a fine person that worked very, very hard. Anyway, his dad came in one day, and called me, and wondered if I'd come out and talk to him. I did; and he said, "Is Joe going to get a letter?" I said—you know, tact—I said, "Well, I haven't really decided yet." And he said, "I'll tell you this—"—remember, I'm just a young man / was very, very young—and he said, "I'll tell you—if he doesn't, I'm going to have your job." John: Yes; he did. I didn't like that, and I ended up by not giving the boy his letter. I feel, down deep in my heart, that I would have given him the letter if it weren’t for the dad. I did something to the youngster because of the dad, and that's wrong—that’s wrong. 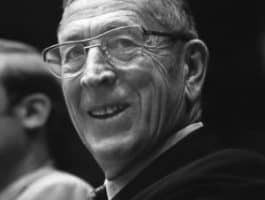 Bob: Well, we’ve been spending time this week revisiting a conversation we had more than 13 years ago with a basketball legend, Coach John Wooden, who coached basketball at UCLA from 1948-1975—ten national championships. But beyond his basketball ability, he was a man who had great character and cared more about the character of his players than he did about their skill as basketball players. I think sometimes we make these great people, like John Wooden, into saints and don’t realize that they, too, struggled with their own humanity at points. It’s okay to have some regrets and to keep on running. Coach Wooden ran all the way to the finish line—he was a winner. Bob: Along the way, he marked a lot of lives—certainly, the guys who played for him, and the assistant coaches, and those who were around him. People became aware of his seven-point creed; and it began to influence a lot of folks as he talked about making each day your masterpiece, and helping others, and being true to yourself—just basic character qualities that shaped his life / his way of thinking and that he pressed into the lives of everybody he met. We have a book in our FamilyLife Today Resource Center called The Wisdom of Wooden: My Century On and Off the Court, where Coach shares his pyramid of success, and his seven-point creed, and all of the things that went into the cultivation of character in the life of Coach John Wooden. Now, we have some folks who live right up the road from us, here in Arkansas—Thomas and Wanda Weathers, who live in Cabot—who are celebrating an anniversary today. It’s a pretty good one. They got married in 1973. Today is the Weather’s 43rd wedding anniversary. We wanted to say, “Congratulations!” to Thomas and Wanda. They’ve been listening to FamilyLife Today for 16 years—they tell us. We appreciate you guys tuning in. It’s always nice to be able to give a shout-out to one of our listeners. And of course, anniversaries—you know that we think anniversaries are a big deal. This is our 40th anniversary as a ministry, here FamilyLife. We are spending the year by celebrating all of the anniversaries God has allowed us to impact through the years because that’s what FamilyLife Today is all about. We want to provide practical biblical help and hope for your marriage and your family, day in and day out, on this program, through the resources we create, the events we host. That’s our mission, here at FamilyLife—to effectively develop godly families because we believe godly marriages and families will change the world, one home at a time. Thanks to those of you who help make all of this happen as you support this ministry financially. In fact, if you can help with a donation right now, we’d love to send you a copy of a book called Becoming a Spiritually Healthy Family. It’s our way of saying, “Thank you for your partnership with us and the ministry of FamilyLife Today.” You can make your donation online at FamilyLifeToday.com; or you can call 1-800-FL-TODAY to donate over the phone. Or you can mail your donation to FamilyLife Today at PO Box 7111, Little Rock, AR; our zip code is 72223. Don’t forget—if you have an anniversary coming up next month or in a couple of months, go online or call us and let us know the date of your anniversary. We’ll send you some anniversary ideas about a month before your anniversary rolls around, either by text or by email, whichever you’d prefer. Go to FamilyLifeToday.com and let us know your anniversary date, or call us at 1-800-FL-TODAY. We’ll pass those ideas on to you. Now, we hope you can join us back tomorrow when we’re going to talk to a mom and a dad who raised three young men—all of whom were almost seven feet tall or just over seven feet tall. All three of these young men were named Mr. Basketball in the state of Indiana, which is a pretty big deal when you’re a high school player. All three of them went on to play college ball and make it to the NBA. We’ll meet Steve and Lorri Zeller, and hear about their boys, and what it was like to raise young men the Zeller way. We’ll talk about that tomorrow. I hope you can tune in. I want to thank our engineer today, Keith Lynch, and special help today from Mark Ramey. On behalf of our host, Dennis Rainey, I’m Bob Lepine. We will see you back tomorrow for another edition of FamilyLife Today. Coach John Wooden was named The Greatest Coach Ever by Sporting News and Coach of the Century by ESPN. He won 10 NCAA championships as Head Coach of men's basketball at UCLA. Since then, his wisdom, summarized most famously in his Pyramid of Success, has reinforced his status as a modern-day legend. His memorable mottos, unforgettable turns of phrase and timeless, sage advice have enriched countless lives.John Wooden died in 2010.